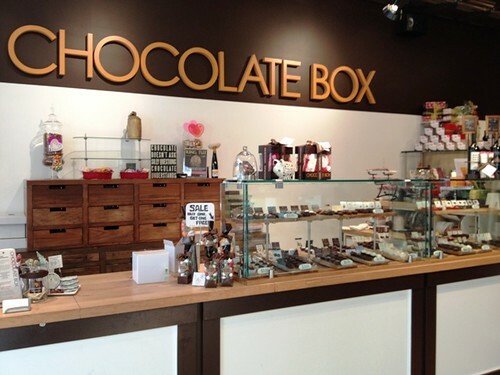 A couple of weeks ago a friend turned 30 and to celebrate his girlfriend took a bunch of us out to a chocolate class at Chocolate Box in Downtown Seattle. They had a class area set up in a little nook at the back of the store. You can see on the shelves that they also sold wine. 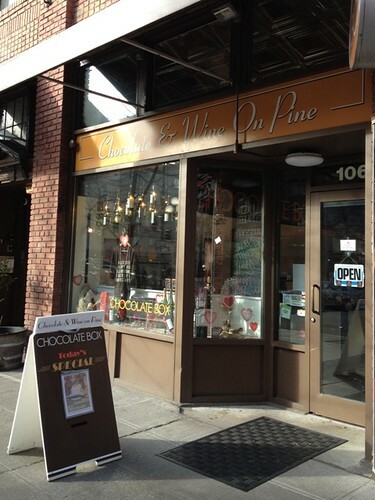 The guy explained that they can’t compete on price with the big stores so they focus on selling chocolate and wine from (mainly local) small producers. To begin with they gave us some hot chocolate with marshmallows. 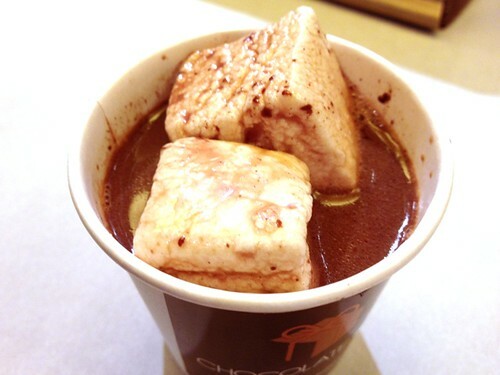 The photo made it look a bit gross but it was the best hot chocolate I’ve ever had! 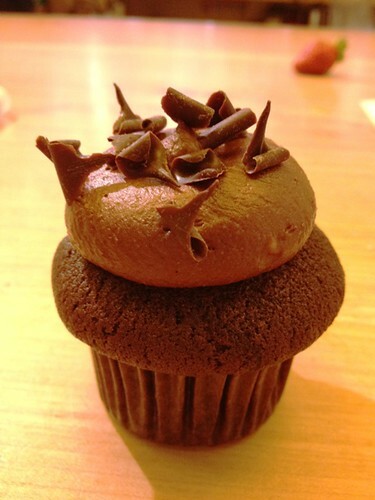 It’s made from melted chocolate, not cocoa powder, and it was really rich – more chocolatey than milky. The marshmallows were also really good – apparently they’re made by hand by some local company. By the way it’s a small cup (maybe shot glass sized), not giant marshmallows. 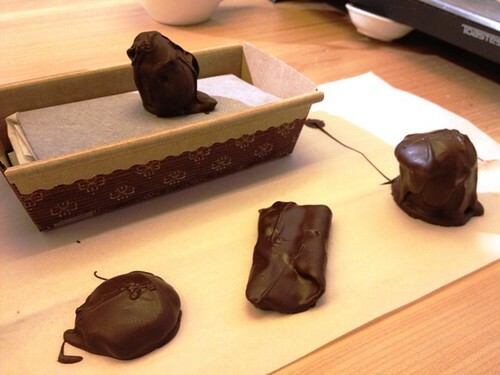 At the start of the class we learned about how chocolate is made (from a fruit!) and what it goes through to become a chocolate bar. 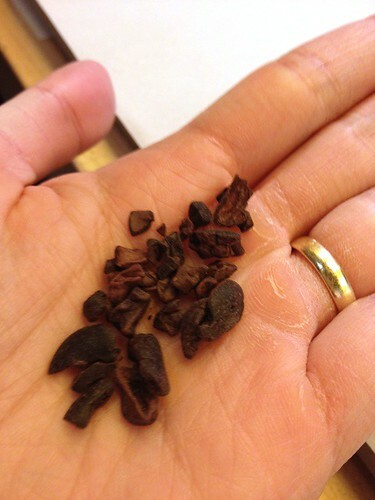 You can wiki the process if you’re interested but this is one of the steps – the cocoa nib. Please forgive my gross gym calluses. The nib is pretty much a health food but it is super gross. Apparently some people don’t mind it but I found it really bitter. 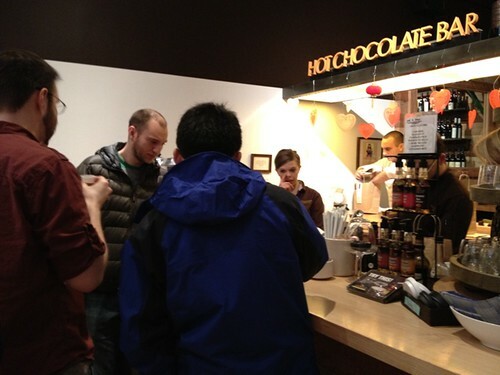 The guy also talked about distinguishing good chocolate from mass market chocolate. The main one that I remember is that good chocolate has a lingering mouthfeel – it kind of coats your mouth even after you’ve eaten it, if that makes sense. It’s also rich enough that I reeeaaally didn’t want to eat lots of it. 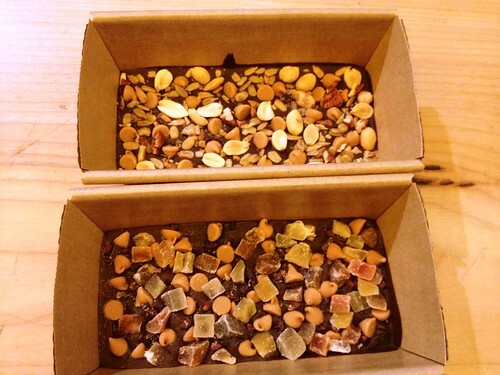 After the talk we made our own chocolate bars and decorated them with nuts, fruits and spices. 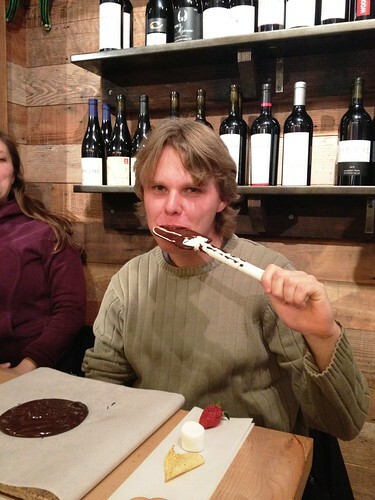 As the birthday boy Luke was allowed to lick the spoon. Our chocolate bars were taken off to cool while we did the rest of the class and we got them back at the end. The top one is mine. I had cardamom, sunflower seeds, peanuts, walnuts and peanut butter chips. The bottom one if James’. 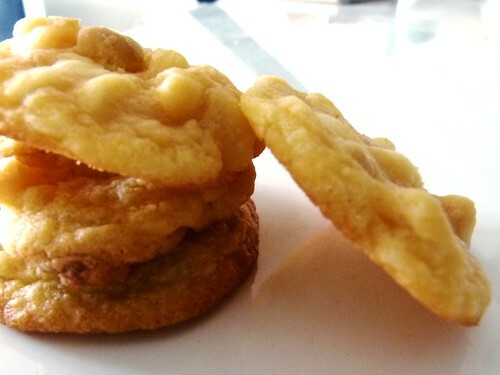 He used habanero sugar, peanut butter chips and dried fruit. 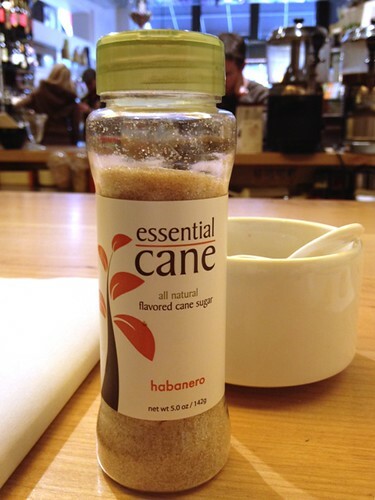 By the way the habanero sugar was awesome – sweet but with a spicy kick. I don’t know what you’d use it for but I was pretty much sprinkling it on my hand and licking it off. For the next part of the class we got to temper our own chocolate and coat various things (marshmallow, tortilla chip, strawberry and two biscuits) with it. James decided to be artistic and put one of the biscuits on top of the marshmallow to form a chocolate mushroom. 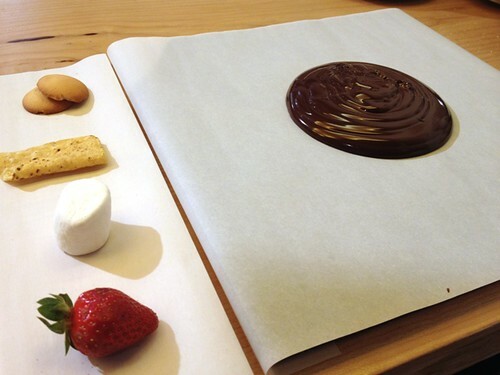 There was a granite stone underneath the paper to cool the chocolate. But if we just left it like that it would have cooled unevenly so we had to keep lifting up the melted chocolate with our fingers and letting it trickle down. 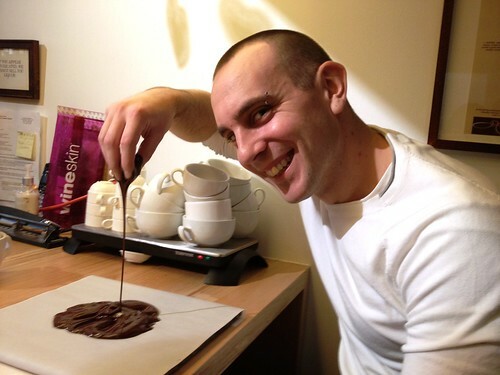 This is James working on his chocolate. I don’t know why he is as rosy as Santa. We got to keep the leftover chocolate – but it’s really rich so I’m still making my way through it a week later. James was much better at it than me. His chocolates turned out really well – they got a nice hard shell quite quickly and the guys that worked there commented on his tempering skills. On the right you can see his chocolate mushroom. We also got a delicious teeny, tiny cupcake while we waited for the chocolate to cool. That strawberry in the background is one that James dropped on the ground earlier. Luckily they brought over a replacement strawberry for him. Some of the guys forgot about their strawberries until a few days later so had to throw them out. Which was unfortunately because they were really tasty. James ate his a day after I did, but was a bit grumpy that I had remembered to eat mine but hadn’t thought to put his in the fridge. Sorry Jamesy! Here are the guys sampling a bunch of chocolates at the end of the class. 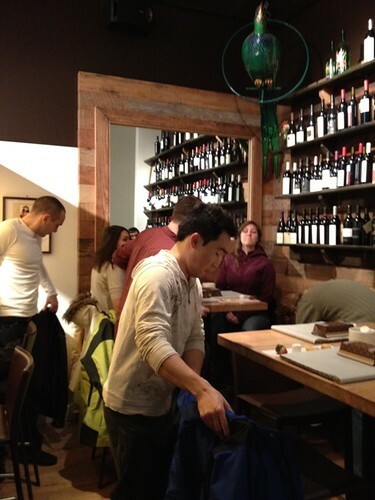 Behind the bar is where we were earlier, and in the background you can see James packing all our chocolates up. Everyone shopped while we waited for our chocolates to cool (a lot of us had tempered poorly!). We were all given 10% off vouchers as a thank you – I haven’t used mine yet but I want to pick up some chocolate bits to use in cookies and some of the chocolates that we sampled. Overall it was really fun! We learned some useful chocolate facts (chocolate doesn’t get better with age – the best time to eat chocolate is now!) and had a great day out with friends. Actually now that I think about it I think we spent that whole weekend with the same group of people (snowboarding and dinner on Saturday, and on Sunday brunch, the chocolate party, and another friend’s housewarming party in the evening). Everyone gets along and we do lots of stuff together. I think we got really lucky with James’ team – living in Seattle would be much less fun if he didn’t work with such great people. Sunday is the Ground Zero end of year party so I thought I would bring some cupcakes to celebrate. 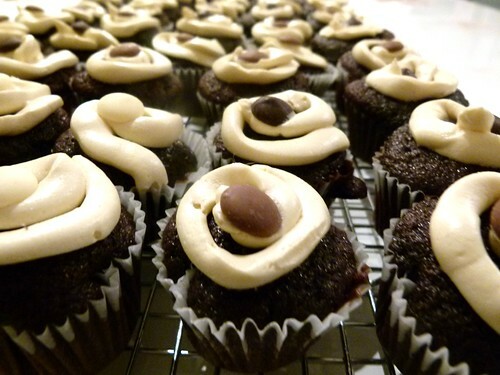 Chocolate Guinness cupcakes sound weird, but they’re pretty much just chocolate cupcakes, with a bit of extra depth. I’m not a beer drinker but I can’t even taste the beer in these. It’s from this recipe on Epicurious – I’ve made it before but this is the first time in cupcake form. The recipe makes a LOT. If I make the whole amount, I have to use a bowl so big that I could conceivably sit in it. If you don’t have a sittable bowl, I’d recommend halving the recipe. Preheat oven to 175C. Butter three 8-inch round cake pans with 2-inch-high sides. Line with parchment paper. Butter paper. Bring 2 cups stout and 2 cups butter to simmer in heavy large saucepan over medium heat. Add cocoa powder and whisk until mixture is smooth. Cool slightly. Since I made mini cupcakes I only baked them for 12 minutes. 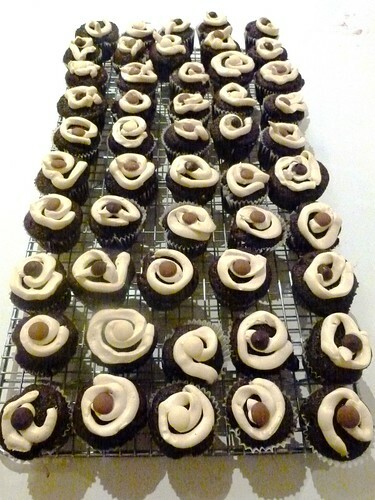 The half-recipe made about 60 cupcakes. Last time I iced it with a Tia Maria buttercream frosting but I left the Tia Maria at Shoreham after our fishing weekend, so I just went with Baileys.I was originally also going to attempt a Chambord one as well, but that didn’t turn out so I had to trash it. This is a great basic buttercream frosting recipe – last time I made it James actually ate the leftover frosting out of the bowl. And when I stared at him, he just TURNED HIS BACK ON ME and kept eating. I topped them with chocolate buttons. For flair! The cake is very rich and I was worried that the full sized cupcakes would be too much so I opted for mini cupcakes. Having made them, I have to say that I’m not a huge fan of cupcakes in the mini form. I mean, they’re very cute, but there’s too much fiddling around moving the batter into the liners. I’m pretty sure I lost a dozen cupcakes or so to spillage. Also just a mouthful. I want more cupcake! I’m pretty sure James feels the same way, because he just loaded himself up with 3 or 4 cupcakes before he went upstairs. 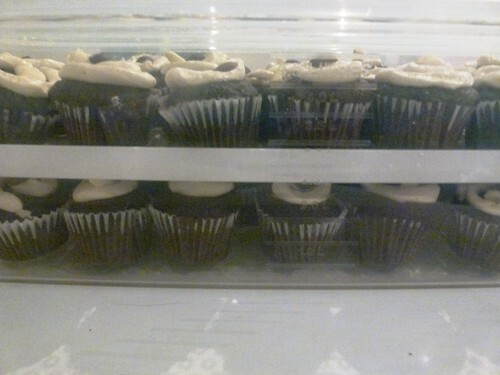 As a precaution I pre-packed the cupcakes, ready for Sunday afternoon. I’m quite pleased with the cupcake stacker (though it seems designed for mini cupcakes – I wouldn’t be able to use the layers for regular-sized cupcakes). I don’t know if that’s enough of an incentive to brave the whole mini cupcake process again. I swear it added about 40 minutes to the cooking time. Also two of the spoons I used to portion out the cupcakes drowned in the batter when I wasn’t looking, and I had to fish them out later. I kept getting batter all over my hands – I’ve washed them repeatedly and they still smell like chocolate! I don’t think you can get much easier than the recipe for Nigella’s sweet and salty crunchy nut bars. There is the barest hint of cooking, but everything else is just assembly. It’s pretty tasty for the effort, but in my humble opinion, not as tasty as the chocolate, caramel and peanut slice that I’ve made before. This is a bit too densely chocolatey for me, though James seems very fond of it. Still, James eats a lot of weird stuff – the other day he put some Indian spiced nuts (the packet says Hot Party Mix) into his yoghurt for breakfast. I’m sure it must have tasted foul – he even made a face when he took his first bite … but then he kept eating! Not that I think this slice is in any way equivalent to James’ Hot Party Mix Yoghurt. I’m just saying. He’ll eat anything. Like a labrador. I misread the golden syrup and only included 1 TBSP (instead of 3) but it seems fine like that. Like most other chocolate and nut concoctions, this one is ugly and unphotogenic. I used a 26cm springform cake tin but you could use any container you wanted. Line cake tin with foil. Break chocolate into pieces, and drop into a heavy-based saucepan. Add the butter and syrup, put on a low heat, and melt gently together. Tip the peanuts into a bowl, and crush the Crunchie bars with your hands. Take the melted chocolate mixture off the heat and stir in the peanuts and crushed Crunchie bars, then tip straight into the cake tin or foil tray. Smooth the top of the mixture as much as you can. Put into the fridge for about 4 hours and, once set, cut into slices as desired. It’s supposed to serve 24 but I reckon it would serve more because it’s pretty rich. 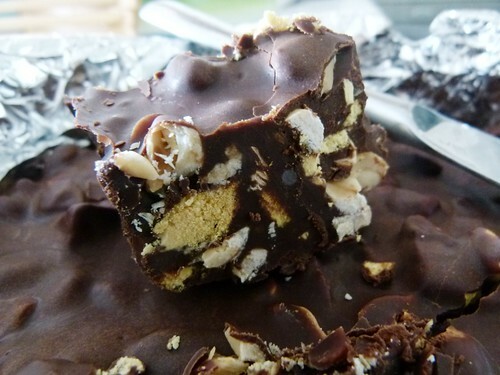 The recipe is pretty flexible, and you can change the ratio of dark to milk chocolate and play around with the fillings. If you wanted you could add some Hot Party Mix, but then you would be weird. 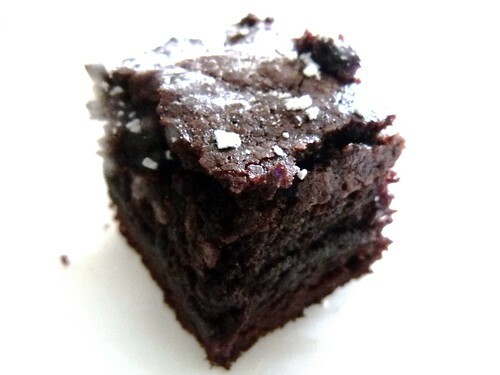 This is a slice that will make your heart race and put you in a sugar-induced coma. It’s an explosion of chocolate and peanuts and ooey gooey caramel, and it is so, so easy to make. Really it’s just a matter of layering and waiting and spreading and waiting some more. Probably the hardest part is cutting them up at the end, because it can get pretty messy when the chocolate flakes off. Crumbs everywhere! You can see some of the crumb explosion in this photo. 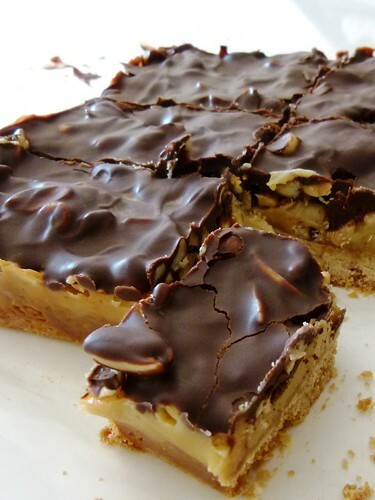 Also the layers – yummy biscuit base, then a layer of caramel, then a layer of peanuts, topped with chocolate. The Moser Roth chocolates from Aldi are perfect for the chocolate topping. They come prepackaged in 30g rectangles, so I use a mix of 3 portions of milk and 2 portions of dark chocolate. According to the original recipe from Taste, it’s supposed to serve 16, but I cut the slice into 24 pieces because I find that a little goes a long way. But then again you could be like James, who once looked at the slice cooling on the bench and said “I bet I could eat that all by myself”. To make the biscuit base, combine the flour and sugar in a medium bowl. Add the melted butter and stir until just combined. Spoon mixture into the prepared pan and press firmly over the base. Bake in preheated oven for 15 minutes or until golden. Remove from oven. Pour the hot caramel over the biscuit base. Bake in oven for 10 minutes or until caramel begins to bubble. Remove from oven, sprinkle peanuts on top, and set aside for 1 hour to cool slightly. Place the chocolate and cream in a medium saucepan over low heat and stir with a metal spoon for 1-2 minutes or until chocolate melts and mixture is smooth. Pour the chocolate mixture evenly over the peanuts and use a round-bladed knife to smooth the surface. Place in the fridge for 1-2 hours to set. Cut into 16 pieces to serve.